I’ve done photography for Warbirds, the magazine of a group dedicated to the preservation and safe operation of ex-military aircraft. I was asked what went into taking photographs and shooting video around an ever busy flightline, so here are a few thoughts. As a photographer and DP, I know I need to look at the job in its most basic form so that I can figure out what I want the image to say as part of the final story. As an artist I also want the images to be emotional and not flat and technical, unless of course, there is a direct technical aspect that the image has to deliver. As I develop my plans for the job, I next want to understand what I will be doing each day during the shoot. Will I spend most of my time on the flightline? How much time will I spend in the air? Am I expected to mix in interviews with the older veterans, pilots or other crew? Is the shoot to take place at night or in poor weather conditions? Each of these factors will influence both the final images I come away with as well as my preparation for taking them. I prepare the cameras to withstand the conditions of being on the field for the one week of rain, dust and the oil and smoke of piston-powered aircraft exhaust. I clean each camera and each lens every night. Lenses of course are also checked regularly on the field for necessary cleaning. I rely on a few micro-fiber cleaning cloths and a “rocket” bulb-style manual blower for this purpose. I also keep three times the amount of camera batteries you might normally take along each day. Why three times? If you have a battery failure or forget to recharge one set then you still will have enough to shoot that day. I’m just as careful to have enough memory cards, and carry them with me at all times. Make sure you have a system of numbering and identifying all batteries and memory cards on hand so you can track which are charged, which cards are empty, etc. Update this throughout the day. Making sure that if you are shooting in a potentially dangerous situation that you plan and talk to all involved parties is just good common sense. Safety always comes before getting any shots on a site as busy and potentially dangerous as an active airfield. As a photographer or videographer you must be aware of all conditions around you at all times, and you need to make sure others are just as aware. For example, if it’s too noisy and I cannot talk to a pilot when he’s in an aircraft, I try to be in his line of sight at all times. If I am on the field, one of the best places to set up at is a number of feet behind the line crew. This also allows me to get the shot of the interaction between those in the aircraft and the ground crew. Standing close behind an active aircraft isn’t smart, nor anywhere inside that aircraft’s turning radius. When I talk to pilots I always make safety paramount. Avoid placing the camera in any position that can compromise operation of the aircraft or visibility or possibly even the loss of the object overboard. If you are flying secure every item but make sure you can access it when needed. If you are using a tripod on board tie it down. Carrying additional nylon straps and a magic arm or two in you kit helps. But ask the pilot first before you start clamping to any surface! Of course you’ve already secured permission from the field’s Operations Manager, right? Keeping informed with a radio receiver tuned to the right frequency is also a good idea. If you move be sure that everyone knows where you are going and get permission again. Problems can occur quickly, so always make it clear where you are and where you are going..
People often ask what cameras do I use when shooting aircraft, whether in flight or on the tarmac. The answer depends on the subject. I usually take along two DSLR camera bodies and three lenses. In my case I’ll have a Canon 5D Mark II and a Canon 1D Mark IV. The lenses include a wide zoom 16-35mm f/2.8, a medium zoom 24-70 f/2.8 and an image stabilized Tele zoom 70-300 f/3.5- f/5.6. I also have ND filters and a circular polarizer filter for use in reducing reflections when needed. If you’re anywhere that it might rain, you need to pack rain covers and cases. I currently use KATA Rain Covers to protect from poor field conditions. Moving equipment around is always a pain. To keep down weight I use soft cases that fit on a large 2-wheel cart that folds flat for storage. When shooting on the ground I keep to the midrange of the cameras settings. As things change fast and you may not have the time for painstaking setups, use the auto function even though some pros may frown on it. Auto does the job on most static subjects in normal daylight, and usually it’s most important to work fast. However I favor high shutter speeds if I need to catch moving aircraft and regularly work at 1/2000th of a second during an airshow. There is a second school of thought that propellors should be blurred for stills. If you want to do that be aware the aircraft will be possibly blurred as well. Camera sensors generally work best near their native EI (Exposure Index). I keep my Canons set at 100-400 for fairly low noise (less grain) but sometimes I purposely shoot at a much higher EI to get an effect or to capture a low light scene. Recently there has been the introduction of a number of larger sensor video cameras such as the Canon C300, while just last year we saw the Sony FS100 and Panasonic AF100. Such CMOS-based cameras can shoot aircraft well, since you’re getting large sensors with good glass in compact packages. However, test these with various subject matter you’re likely to come across such as spinning propellers. CMOS sensors can create issues with moving objects where straight things are skewed in the shot. With propellers this can create a sickle shape or other distracting unnatural shapes. 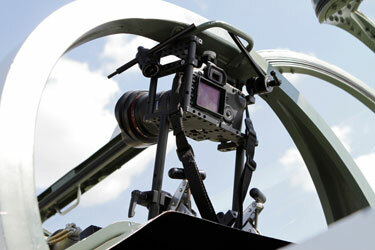 But while larger camcorders are fine on the ground, HD-capable DSLRs are obviously ideal to shoot with when you’re faced with the tight surroundings of a classic aircraft cockpit or doing hand-held shots. A good carbon-fiber tripod with a small fluid or friction head carefully matched to the weight of the camera is another basic tool. If it’s new to you, practice creating smooth pans and tilts. Nothing will get your audience sicker than unsteady shooting with rapid zooming or jerky movement. If you intend to hand-hold use a wider angle lens and avoid telephotos even if the camera has a built-in stabilization system. While there are external stabilizer rigs such as the Steadicam, these specialized devices can be expensive to rent and require either hiring a camera operator or spending the time to learn it well. Audio of course forms the second half of most video productions. Having the right microphones for the job is crucial here. Wind noise and extremely loud sounds are simply part of shooting aircraft, so be prepared with gear that can handle high SPLs. Lighting should be kept to a minimum unless you can control the entire scene. Smaller LEDs can be a lifesaver but placement of these lights is crucial because of safety concerns when working with active aircraft. This is obviously only touching on what goes into shooting on location in an airport. You can reach me at my website if you have further questions.